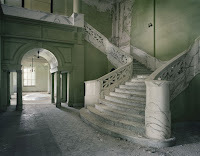 Christopher Payne's book of abandoned Asylum photographs beckoned me in at St. Marks Books a few weeks ago, and I haven't been able to get these haunting memento mori out of my head since. Dr. Oliver Sacks' forward on the cultural history of mental health institutions is equally full of pathos. New Scientist provides an overview of Asylum: Inside the closed world of state mental hospitals, and includes a sampling of 15 unshakable images.